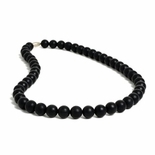 Chewbeads are non toxic jewelry for mom, safe for baby to tug, touch and chew. Most babies love to put everything in their mouth and necklaces are usually their favorites. Moms, don't feel comfortable letting their baby chew on jewelry, with the concern that they might break or have unwanted chemicals. These amazing collection of necklaces and bracelets, are soft, non-toxic jewelry, colorful, chic and, above all else safe.